Climate Games: the world’s largest Disobedient Action Adventure Game! It’s December 2015. You have a heart filled with courage, a mobile phone and plans for creative mischief. Your team is ready to merge street and online disobedience. The COP21 UN climate summit is just opening in Paris. Manifestations of ‘the Mesh’ — austerity-dictating politicians, fossil fuel corporations, industry lobbyists, peddlers of false solutions and greenwashers – are converging to solve the climate catastrophe. Or so they tell us. We are not convinced. Your objective is to join the global movements swarming to shift the game against profit and in favour of life. The Climate Games are where action-adventure meets actual change. Anyone can play this real-time, real-world game and turn Paris and the world into a giant, direct action playing field for climate justice. We have everything to play for – but time is running out. The Climate Games is a trans-media action framework that was originally developed in Amsterdam in the summer of 2014 by Groen Front. Two climate games took place in the Port of Amsterdam (2014, 2015) and over 200 activists took part in a diversity of acts of creative disobedience. For the COP21 in Paris the concept is being evolved and scaled-up for the mass actions already planned by social movements against the corporate takeover of the UN. To develop the concept, art activist collective The Laboratory of Insurrectionary Imagination facilitated a series of Hackathons, which brought together artists, activists, developers, performers, coders and gamers. These took place as part of cultural festivals in the Berlin Festspiele theatre, The Vooruit cultural centre in Ghent and Arts Admin in London. 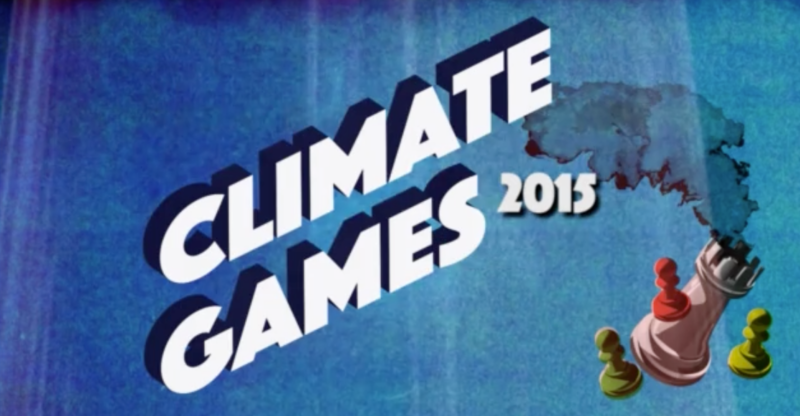 Various individuals and networks have endorsed the Games, from Climate Justice Action to Naomi Klein.